Ro-Mop Skimmers – SOS Safety International Inc. The RO-MOP is ideal for recovery of light, medium and emulsified oils in rivers, lagoons, swamps and other inland waters. Long lengths of mop can be used enabling oil some distance from the wringer unit to be collected. 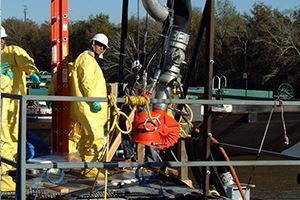 As the mop system is an oleophilic (oil attracting) system only a small percentage of water is picked up with the oil – typically less than 10 percent! 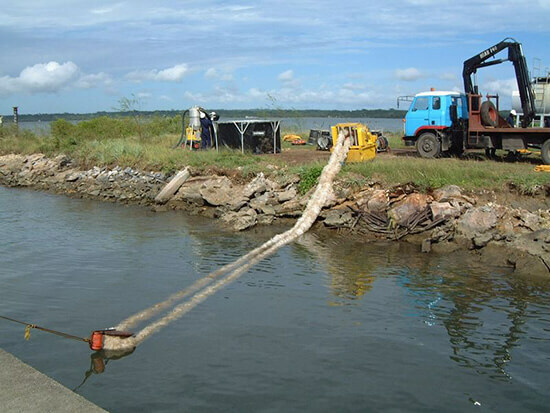 The RO-MOP system comprises of a powered wringer unit which is mounted over a collection tank and an endless loop of polypropylene rope mop which is directed across the water surface, in some cases using a floating pulley. As the mop circulates over the water surface oil sticks to the fibres. This oil is squeezed out of the mop as it passes through the machine, and drained into the collection tank. The mop fibers are open ended and therefore do not pick up trash. The wringer unit remains on the bank, only the mop is placed in the water. The RO-MOP is highly reliable and very simple to maintain. The moving parts principally comprise of motor, gearbox, chain, sprockets and rollers. RO-MOP units are available in a variety of drives to suit most applications – emergency response or fixed installation. The OM140 is a simple but extremely effective and versatile Rope Mop skimmer. 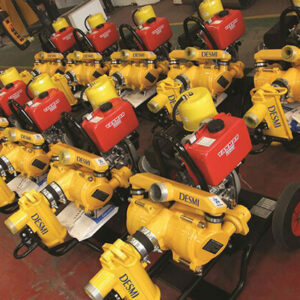 These machines have been used in oil spills and by customers in various industries with great success for many years. The OM140 Rope Mop skimmer is housed in a strong and rugged stainless steel frame. The powered rubber rollers are used to drive the oleophilic mop through the skimmer and squeeze the oil off into the sump or tank. The standard tank offered with the OM140 has a capacity of 300 litres, and has wheels and handles for easy operation and manoeuvrability. The skimmer can alternatively be used with an oil barrel, a collection sump, or similar if more convenient. During operation, the skimmer will recover a wide range of oils, from light to medium viscosity. With the injection of heat into the liquid, fats and heavy oils can also be recovered. Due to the unique construction of the rope mops, the fibres are oleophilic and opened ended to ensure they recover oil and reject water. 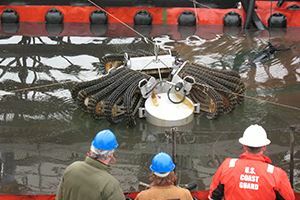 Placing a twist in the deployed mop ensures greater recovery of oil and that items of trash cannot get entangled. The lightweight OM140 is easy to deploy and operate. 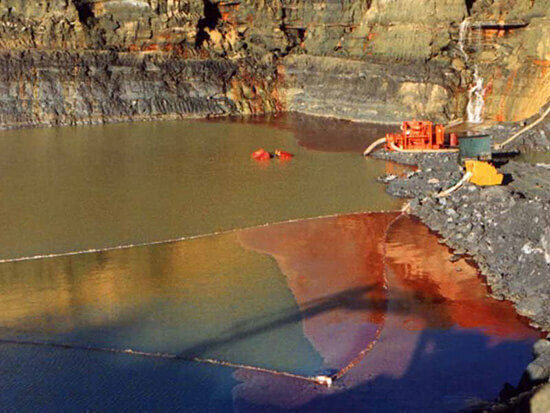 Using the skimmer with a 90m mop, it is possible to recover oil from distance, either horizontally or vertically. 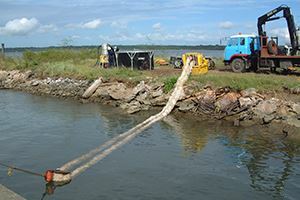 This allows recovery from narrow spaces such as drains and pits, but also wide open areas such as lakes or rivers. 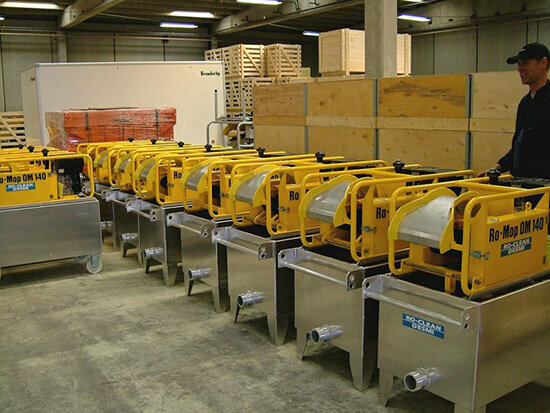 This versatility makes the OM140 mop skimmer an ideal choice for first line defence in oil spill emergencies.